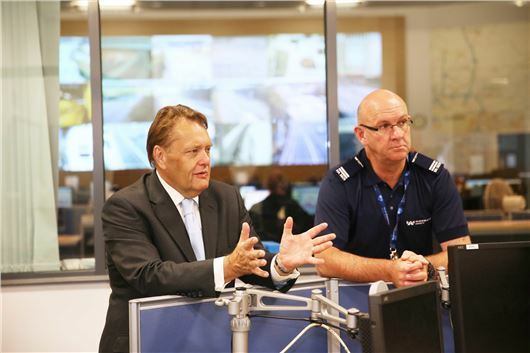 Roads minister John Hayes has visited one of the busiest control centres in the country for an update on congestion cutting motorway schemes. The minister - who took up his post at the Department for Transport in July - embarked on a fact-finding mission to the Highways Agency's east regional control centre on the northern section of the M25 to see for himself how new ‘all lane running' motorways are working. The new road combines pioneering technology and the use of the hard shoulder as a permanent running lane to boost capacity and reduce congestion, improving journeys for all road users. The schemes use dozens of cameras and roadside sensors to monitor traffic flow and allow staff to respond quickly to any incident, while message boards on overhead gantries can close lanes swiftly to respond to any incidents and keep drivers safe. The three M25 schemes total £317 million of investment. All-lane running between junctions 23 and 25 and junctions 5 and 7 opened to traffic in April, while work on a third scheme between junctions 25 to 27 is due to complete this winter. Hayes said: "It is impressive to see how technology can transform a road network, providing a service the public can better rely on, and to see for myself the work of the control room and the expertise of the personnel whose dedicated efforts make journeys safer and roads more efficient. "More than a quarter of a million vehicles drive through these sections of the M25 every day so it is very important we do everything possible to cut congestion, which is estimated to cost over £2 billion every year. “The concept of smart roads, smart drivers and smart motoring will inform and inspire a new generation of road users. "The government has committed a record £1.7 billion investment to infrastructure in the south east to add an additional 145 lane miles of capacity by 2021. This will help keep our country moving and continue to boost our economy." The regional control centre directs nearly 200 traffic officers across nearly 400 miles of motorway and trunk roads, including stretches of the M1, M25, M4, M40, M11, A1(M) and A14.